Fans had hoped to help bring a few significant Japanese Wii games stateside, but Nintendo just says "no." While the Wii suffers from a lack of interesting releases in North America, Japan has been getting titles like The Last Story, Xenoblade, and Pandora's Tower. Each is a respectably to highly-rated game and published by Nintendo, making you think the company would be jumping to release them in North America, but it isn't. Unfortunately, even a focused fan campaign hasn't been enough to convince Nintendo that the west wants these games. The campaign, dubbed "Operation Rainfall," was started to help push Nintendo in the right direction. The first phase focused on Xenoblade, asking participants to call, email, Facebook, Twitterize, and generally pester Nintendo of America about localizing the Wii RPG from the developer of the PS2's Xenosaga series. Fans also pre-ordered the game off Amazon under the previously announced name of Monado: Beginning of the World, making it top the best-selling videogame list on the site, and it still remains on the list as of this writing. Nintendo responded to Operation Rainfall, but not quite in the way that fans had hoped. On its Facebook page, Nintendo wrote: "Thank you for your enthusiasm. We promised an update, so here it is. We never say 'never,' but we can confirm that there are no plans to bring these three games to the Americas at this time. Thanks so much for your passion, and for being such great fans!" Nintendo is somewhat notorious for its staunch anti-localization stances on certain Japanese titles with cult followings (*ahem* Mother 3). 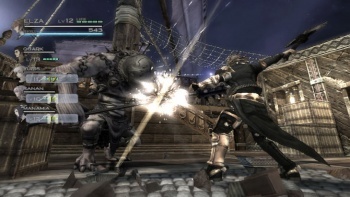 A western domain for The Last Story, a Wii RPG designed by Final Fantasy creator Hironobu Sakaguchi, was registered, but that's happened before with other games that nothing ever happened with. The most maddening part is that The Last Story and Xenoblade have both been announced for Europe, though with region-locked consoles they still won't make for an easy import. I'm holding out hope that at least one of these titles will make it to North America in the near future, but if they don't it'd be a major shame. Thanks for the tip CursedSeishi!